http://sankalpa.tripod.com/roots/s4env.html Last modified: Oct. 3, 1998. If not, tell us about it. The Sunday Statesman 1 Excerpts from 'Writing on the Wall' ;in 'Impressions' (The Sunday Statesman), dated October 18, 1998; page 3. The Statesman 2 Conservation plan for east Calcutta wetlands: The Statesman, dated Sept. 12, 1998; page 5. 3 Watch this space for new additions! 4 Watch this space for new additions! 5 Watch this space for new additions! Today, especially in Bengal, things are going terribly wrong. Many people believe it is because of the moribund bureaucracy - government, institutional, private ... whatever - that is responsible for this unacceptable state of affairs. The objective of 'Stop'n Look!' is to throw the searchlight on the problems created by those people who are thriving in an obsolete bureacratic system - at our expense. We compile information from the media, as well as first-hand reports from our correspondents, that show how callous our elders have become. You will be the ultimate judge of our future direction. 1. Excerpts from 'Writing on the Wall'; in 'Impressions' (The Sunday Statesman), dated October 18, 1998; page 3. Consider the facts. 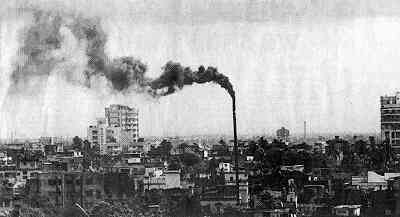 In a detailed survey conducted by the School of Environmental Studies (SOES), Jadavpur University, over the past four years, it was found that at least 1.2 million people in North 24-Pargana are drinking water with an arsenic content of more than 0.05 mg/liter, which is the maximum permissible limit recommended by the World Health Organization. Of the nearly 30,000 tubewells analyzed in 22 blocks of the district, arsenic above the recommended limit was discovered in 19 block. And examinations of nearly 16,000 villagers in 52 arsenic-affected villages reveal more than 10% have arsenical skin lesions. About 7,000 samples - of hair, urine and nails - were analyzed and nearly three-quarters indicated a high arsenic body burden with the likelihood of many being sub-clinically affected. Even some of the piped, potable water supplied by the West Bengal Government is seriously contaminated ... the arsenic content ranging from 0.05 to 0.14 mg/liter. The SOES study reveals 19 of the 31 deep tubewells installed over the past two years by the Public Health dept. 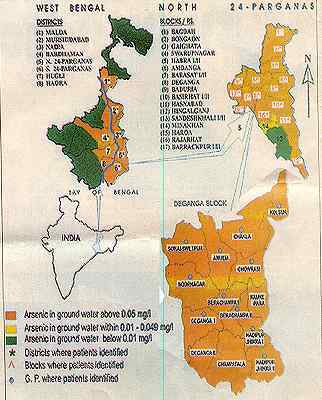 in Gaighata, North 24-Parganas contain arsenic above the safe limit; one block, Deganga, produces about 6 tons of arsenic yearly in the ground water drawn by tubewells for irrigation. Experts say the probability of unaffected tubewells getting affected in due course is very high; it is almost unavoidable. To study the magnitude of the arsenic calamity, SOES - given the limited resources - decided to survey a single district in detail and work out projections for the rest. SOES managed to organize two groups of local youth to assist with the survey. even though the average monthly income of a family of 5 is Rs 1,400, the overall nutritional level is low. awareness of arsenic-poisoning is dismal. Only 10% know for sure what the problem really is. Regarding skin lesions, 60% think these are normal skin disease that can be cured with some ointment; 40% think it is a divine curse. But seeing is believing. Going round the district, one notices innumerable cases of sores, amputations and melanosis; horrifying sights which have become so common nowadays that many people in the district don't react to them the way you and I would. Meanwhile, the stories behind these ailments are touching ... Makhan Pal, a young man of Deganga, developed cancer in 1995 and died horribly a year later. His wife and only son - both suffering from arsenical skin lesions - have survived, while her father-in-law and her husband's second wife have died of arsenic-induced cancer. There are similar stories from Gaighata and other blocks as far away as Barasat, where Shyam Sundar Bore of Bamagachi village has been diagnosed as having cancer of the bladder. The figures would have "increased" if the villagers could afford expensive clinical investigations. 2. Conservation plan for east Calcutta wetlands: The Statesman, dated Sept. 12, 1998; page 5. CALCUTTA, Sept. 28 - The state government is set to prepare an action plan to help preserve the ecological balance in the east Calcutta wetlands. The wetlands, which include sewage-fed fisheries, cover an area of 12,500 hectares. They are the only one of their kind in the country. This is the first time a conservation action plan has been mooted for an urban wetland anywhere in the world. A field base survey, on which the management action plan will be based was submitted to the state government last week. A team, comprising several well-known environmentalists, ecologists, engineers and management experts from all over the country, will be set up to prepare the action plan, a state government official said. The action plan also proposes to work out a scheme to preserve the sewage-fed fisheries. The fisheries (bheris) clear the city's sewer water naturally. "If the bheris are closed, a sewage treatment plant, at an estimated cost of Rs 400 crore, will have to be installed in the city," the official said. There are 286 fisheries in East Calcutta which cover an area of 3232.27 hectares, the survey report stated. Twenty-two of these have become inoperative. But water from these fisheries have not been drained out. The fisheries fall under the jurisdiction of four police stations in South 24-Parganas - Bhangar, Bidhhannagar (south), Sonarpur and Tiljala. The fisheries produce about 10,915 tons of fish annually. Of this, about 6136 tons is produced by 46 bheris in south Bidhannagar police station area. These bheris are larger in size and better managed. The state government will assist both Indian and foreign students carry out research on wetlands, senior officials said. There are also plans afoot to promote the wetlands as a tourist attraction. This is the first time a list of existing fisheries in east Calcutta , along with their area, location and amount of fish produced annually, has been prepared. During the survey, it was found that 17,238 people work in these fisheries as labourers. The total population of the area is 61,000. Of this, 19,238 are literate.